No matter what size your outdoor space is, you can turn it into a relaxing area to entertain year round. Follow these tips and tricks to creating the perfect patio space for you. Creating an outdoor room that everyone loves to use is easy, whether you have tons of space or just a tiny sliver of yard. The trick is to decide how you’d like to use your space, and then make the most of what you have. Some people prefer to entertain, while others like to use decks and patios for relaxing. But we’ll show you how you can use the same space for both, no matter how large (or small) your outdoor living area. Choosing equally elegant plants and furnishings to decorate a large patio gives the space a sense of unity. Take a look at the patio, above. It’s huge, which makes it perfect for entertaining. There’s plenty of room here for a dozen or more guests to walk and talk, and even sit down for a bite to eat. But this patio can also feel intimate and quiet. It’s terraced, so the top level and bottom level feel like separate areas. The use of two furniture sets — one for dining, another for relaxing — make the lower level seem almost like it has two very different rooms. And the use of plants, both on and around the patio, give the whole thing an enclosed, protected feel. Cozy! If you’re working with a large space, but don’t have multiple levels to help divide it up, there are other ways to create intimate areas. Plant a few containers with dwarf Alberta spruces and arrange them in a straight line to create a screen. Or let your accessories identify separate areas. A metal dining set with a green umbrella and green seat cushions will feel like a different room entirely from a pair of metal lounge chairs adorned with sunny yellow cushions and orange throw pillows, even if they’re just on seperate ends of the same deck. Both the cushions and the containers are temporary solutions, so you can easily switch back into entertaining mode. Just rearrange the containers to create open space, or change furniture cushions so everything matches. Use patios and decks to combine the best elements of indoor luxury (oversized, comfortable furniture) with natural beauty (brightly colored foliage and gorgeous flowers). It’ll look great, no matter how much room you have to work with. Not everyone has such a large space to work with. 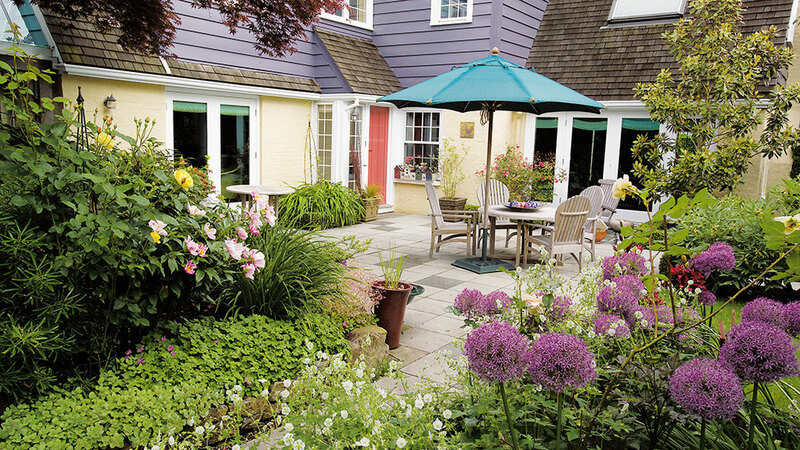 For some, small patios and decks fit their home and lifestyle better. But that doesn’t mean small spaces can’t be perfect entertaining venues! For example, take a look at the low deck in the photo, above right. It’d be the perfect place to serve a family-style brunch to a few close neighbors, or to sip lemonade and chat with old friends. If you’d like to entertain a large group, turn a small deck or patio into a gateway to the rest of the yard. Set up food and drink stations on the patio, and then provide tall tables out in the yard for guests to stand around. Not only will this encourage them to mingle, but they’ll also get to check out your beautiful garden up close! 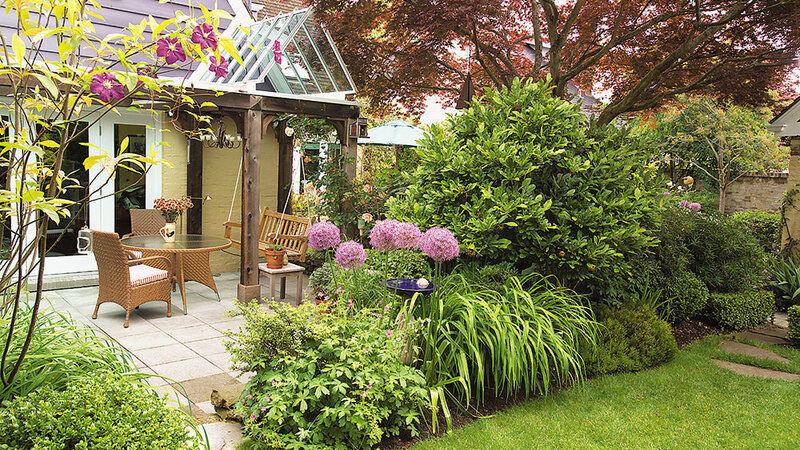 Surround a small patio with large shrubs and lush foliage to create a cozy, intimate feel. 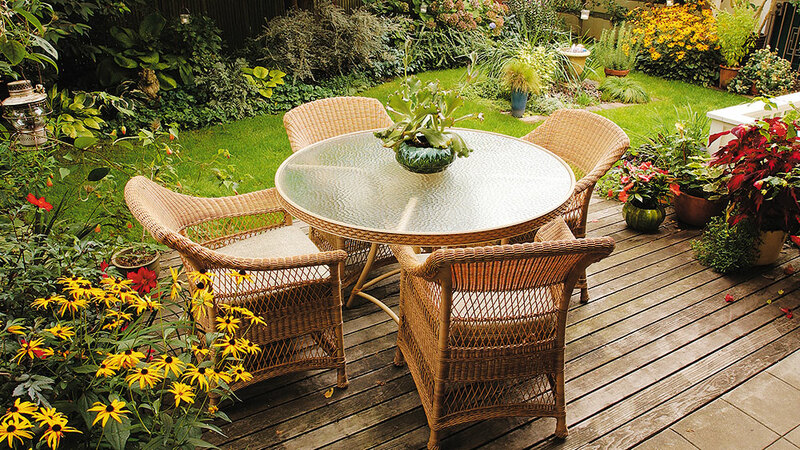 While larger decks may need lots of furniture, smaller patios and decks need fewer (but not necessarily smaller) pieces. Choose furniture that has some visual weight, especially if that’s all you’re putting on your patio or deck. Try to imagine the deck above with a small table and two narrow chairs. Wouldn’t that feel empty? The wider chairs and table here fill in the space and make it feel lived in. And don’t get hung up on material — if you’re not a fan of wicker, there are plenty of similar wood or metal chairs available. Another thing that helps this deck feel intimate is the fact that it’s surrounded by lots of lush plants. Sitting here is almost like sitting in the garden. Choose one or two fragrant plants to grow by the table so guests catch a hint of scent every time a breeze stirs. 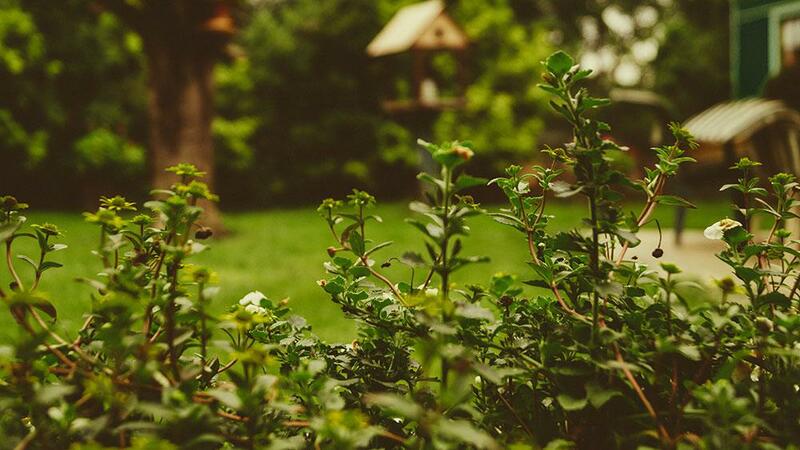 With just a few easy adjustments and a little creative thinking, any space, whether large or small, can multitask as both a relaxing backyard getaway and the neighborhood’s favorite gathering place. Don’t be afraid to play with color! The red-orange door doesn’t exactly match the teal-blue umbrealla, but the bright shades bring life to the neutral furniture and stone floor of this patio. Why settle for ONE patio or deck when you can have two? Multiple outdoor rooms let you assign separate spaces for socializing and relaxing, or for relaxing and eating — the possibilities are endless. Take a look at the pictures on this page. The patio in the photo at left is large, with a big table and lots of open space. It’d be perfect for a cocktail party, with plenty of room for guests to mix and mingle. However, the patio in the photo above is much smaller and more intimate. It would be difficult to stand and chat here, but it’d be a lovely place to sip coffee and read the paper. 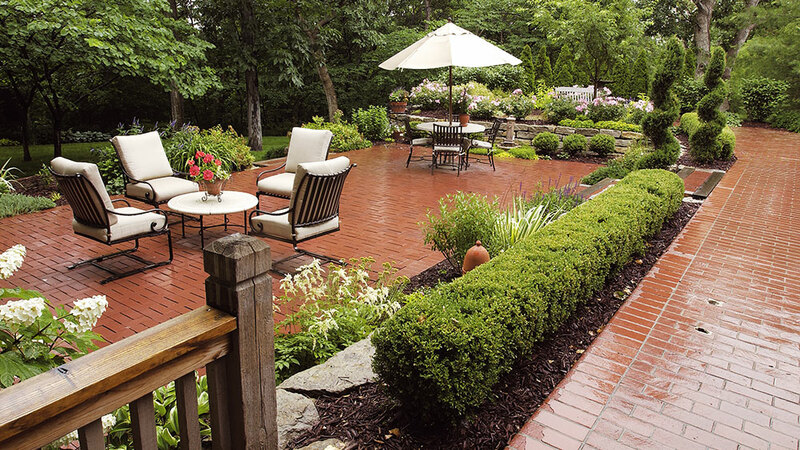 While these patios have very different functions, it’s easy to see that they’re part of the same yard. They have the same stone floor, and they’re surrounded by some of the same plants (such as the purple globe allium). Even though they’re different, they feel related.